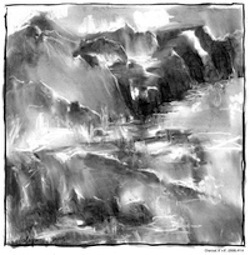 Exhibited infrequently at galleries, charcoal drawings are usually relegated to art classes for quick studies and gesture drawings. I never much cared for how messy I'd get whenever I worked with charcoal! It seemed to be an impossibly elusive medium, smeary and finicky. 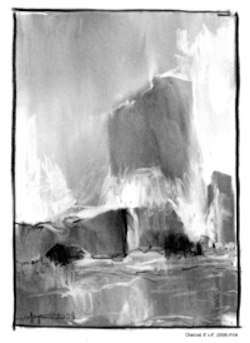 However, when I first saw Tom Graffagnino's drawings, I was moved by the magic that he'd worked with charcoal! He graciously permitted me to include some of the images of his charcoal drawings here, but to really appreciate this terrific Christian artist, you simply must visit his website and linger there! There are pages of art in various media to delight you. Tom is also a writer. He eloquently teaches biblical truths in his essays. His website site is peppered with plenty of poetry to inspire the soul. In fact, to only feature his charcoal drawings here is to do him a disservice. He has painted beautiful acrylics, collages and exquisite pencil drawings. But more than anything else, Tom's faith is what truly must be shared with the readers of this website. Let him speak of it in his own words. "Late one night almost forty years ago in 1971, at the age of 22, I was shown reproductions of the Lindisfarne Gospels and The Book of Kells, illuminated manuscripts done in the monasteries of Scotland and England, during the 7th, 8th and 9th centuries. When I first saw the illuminations, I was awe-struck by the astonishing intricacy of detail of this artistic labor. I remember asking myself at the time..."What, in Heaven's name, motivated these men to invest so much of themselves into this work?" The answer to that question, of course, is "Faith.... Faith in, and living hope for Christ Jesus the Redeemer." For the monks, there was no greater calling than showcasing, glorifying, preserving and spreading the good news of God's Word. Simply put, they were motivated by the love of God. At that time a seed was planted in my heart, and I began to draw. Christ became real to me that night, but in a way that I didn't really appreciate or understand. I kept my relationship with Him to myself, "under wraps", you might say. My understanding of Scripture was worse than superficial. I didn't understand the Christian faith, its history or implications. I didn't understand who I was in Christ. I didn't understand The Body of Christ (The Church), and I only very vaguely grasped the Father's redemptive plan accomplished at the cross by the Son. For years, I simply remained scripturally illiterate. 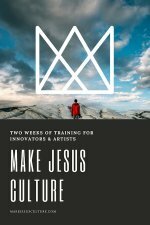 I knew somehow, that any creative urges, the drawings and paintings that I had been doing, I "owed" to the living, risen Christ, but I never thought of the images themselves as being in any way really "Christian". In 1993, I encountered the Spirit of Christ a second time. This time, He opened my eyes wider and gave me a hunger for his Word. My faith, that had been more or less in "gestation", came more fully into the light. Now, (seventeen years later) as I write this in 2010, and reflect on these things....the paintings, the drawings and my Faith...I am convinced that Christ has guided my hand and eye throughout. 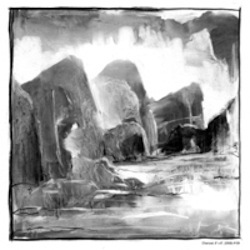 Check out more of Tom's charcoal drawings and read about his faith that under girds his artistic explorations. 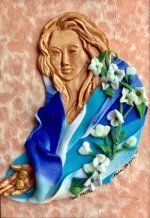 See Elva Robinson's Paper Sculptures. 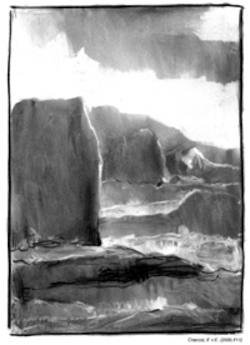 Return from Charcoal Drawings to the Home Page.